All that work laying out flower beds, killing grass, shoveling mulch, and digging 150+ holes to drop plants into has paid off. I’m sitting under the dogwood tree, watching a hummingbird drink from pink salvia flowers not ten feet away while further down the garden a monarch lays eggs on the milkweed. It has been weeks since I’ve had a chance to bring my chair under the dogwood to enjoy the flowers, but yesterday, beast though it was for all the chores, I got all of my must-dos done so I could do exactly that: sit under a tree and watch the hustle and bustle of a summer flower garden. 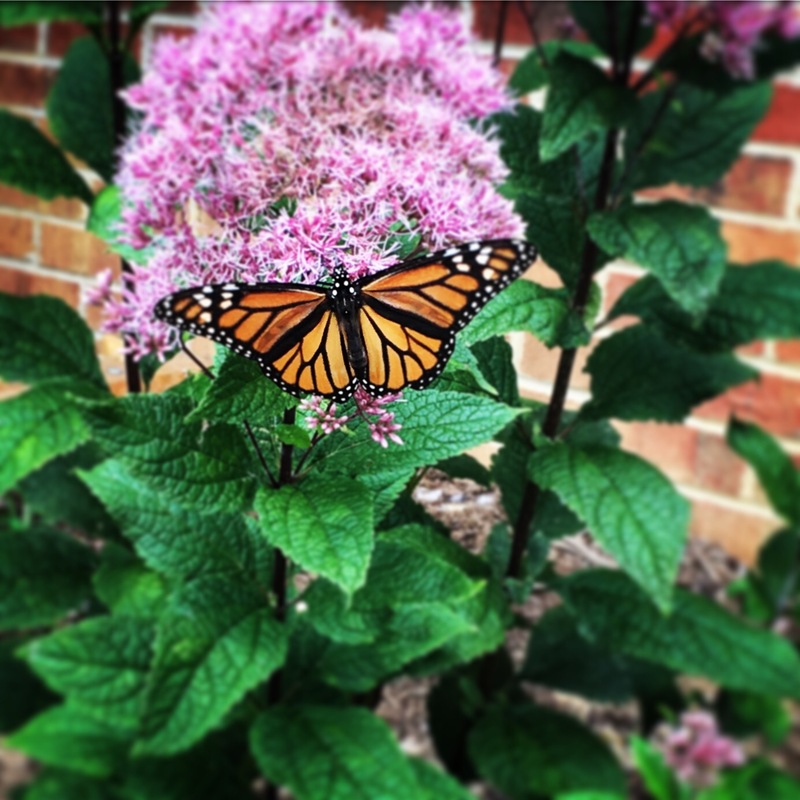 We’ve been getting more butterflies as August marches on, and I usually see them from the car window as I arrive or depart the house, or from the living room window while I type on my laptop for work. Not enough do I come out and sit in the fresh air with the mountain breeze and the insect sounds. Yesterday, amidst all the chores and errands, I squeezed in some gardening in the horrid heat. I got to see everything up close again and engage with the flowers, the herbs, the bees, the dirt, the aphids. I waded through waist-high salvia to deadhead, chopped forests of thigh-high basil, cut milkweed so infested with aphids I couldn’t touch it without getting little orange bodies all over me, and pulled tufts of grass and dandelions until my fingernails hurt. 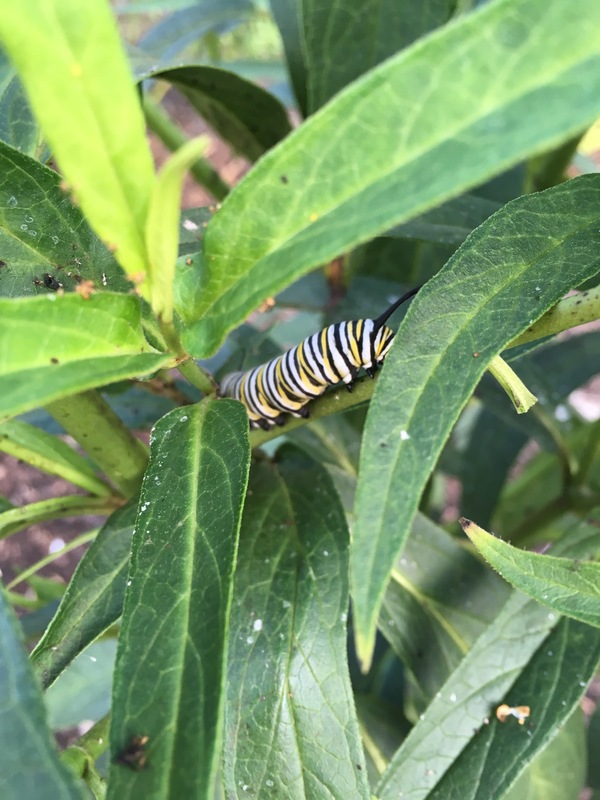 And in the middle of all that chopping, weeding, and squirting aphids with soapy water, I saw our first monarch caterpillar. That fat, squishy, striped baby butterfly made every bit of the work worth it. Now, I hear the rat-a-tat of cicadas, the buzz of two fat bumblebees, the honk of a Canada goose flying overhead, and the shh-shh-shh of my husband sanding our canoe in the garage. A cool breeze lifts the pages of my pretty journal, and glassy dragonfly wings shimmer in sunlight over the grass. The butterflies weren’t out when I first came out. The morning was too young. But now they’re coming. Metamorphosis of Monarch Butterfly, magic of nature. Thank you!!! I didn’t know what the little orange bugs were on my milkweed. But you told me. So went out and sprayed them off with water and a non-chemical bug spray. Whew. Thanks!!! Andrea, you write so well, I was there with you. Thank you. 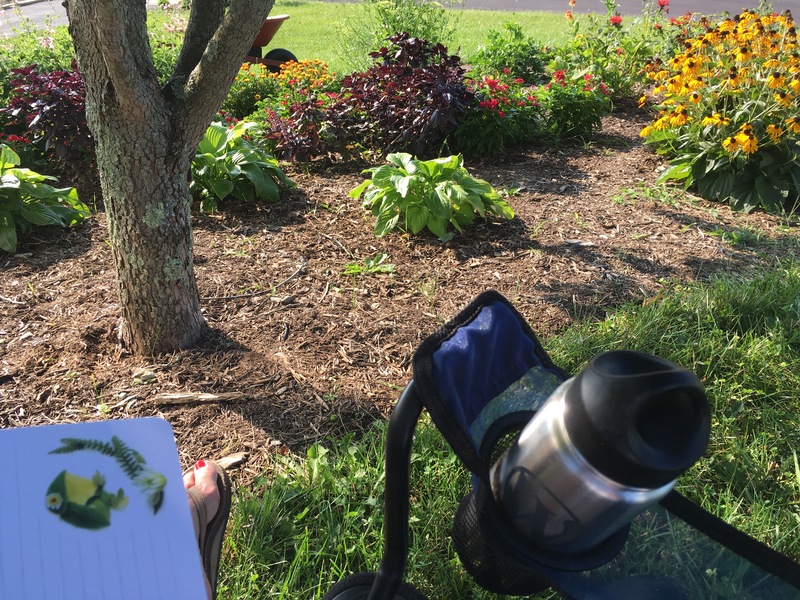 Love your garden and your writing, very descriptive and pretty pictures!